When you work in an office environment, you might not be able to hide your new hearing aids from your coworkers. When you work in an office environment, you might not be able to hide your new hearing aids from your coworkers. Presumably, they will take this in stride and do their best to accommodate you,so you don’t feel left out or ignored during the busy work day. Here is some useful advice on what you can do to get the most of your hearing aids while you’re at the office. 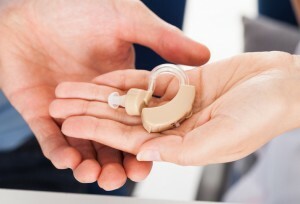 First, try pairing your hearing aids with other devices you use throughout the workday. Link your aids to your smartphone through the ever-useful Bluetooth function on your phone, just be sure your hearing aids are also Bluetooth-enabled. This way, any nearby speech can be picked up by your phone and sent to your hearing aids. You can also use this technique to distinguish the voices and words of your colleagues during a busy meeting or to take a phone call while you’re at your desk and there is a lot of noise around you. Alternatively, you could try using other forms of assistive technology. One piece of equipment you could use is known as an amplified telephone. By using this phone, you can increase the volume setting on your desk phone. If you don’t have access to a smartphone, this method can present an ingenious workaround. Do you have many noisy coworkers, and you can’t close a door or rely on cubicle walls to muffle the sound? In that case, the amplified telephone might be your best bet. Don’t forget to keep spare batteries handy. You can store them in your work bag or your desk drawer – it doesn’t matter, as long as you can reach them when you need them. Leaving a hectic meeting to get replacement batteries can frustrating. Indeed, having to leave work to find new batteries while on a business trip to another city can be even more confusing! Depending on where you sit, find the best position to lip read; this might seem strange when one of your coworkers approaches your desk, but just explain the circumstances and help them understand. Reading lips and understanding body language can go a long way towards helping you fill in the gaps, especially when you can’t catch every word. Be sure to sit well away from any distractions during a group meeting so that you can hear everyone speak. This entry was posted on Friday, November 10th, 2017 at 9:40 am. Both comments and pings are currently closed.